Velvet Jacket is now complete, with alternative covers for all the Classic Doctor Who stories officially released on DVD. Each high-res cover can be downloaded and printed to give your DVD collection a uniform look. Click the Printing and FAQ links at the bottom of the page for help. 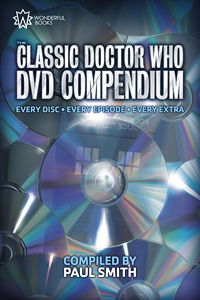 Now the Doctor Who DVD range is complete, my book The Classic Doctor Who DVD Compendium makes the perfect companion. It's a celebration of a unique set of releases, cataloguing every disc and every extra, all fully indexed so you can easily find any item you want to watch and get the most from your collection.